Beijing, January 31: Extending the relations between the neighbours on a higher strategic level, India and China conducted the 8th meeting of the India - China Joint Working Group on Counter terrorism which was held in Beijing on 29th and 30th of January this year. Both sides assessed and exchanged views on the regional and international counter-terrorism situation, areas of mutual concerns including cooperation at bilateral and multilateral level. Meanwhile, the next round of dialogue will be held in India at a mutually convenient time. 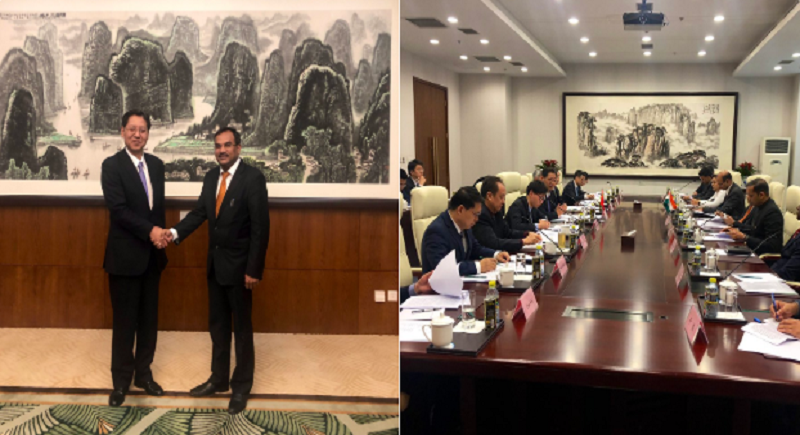 Meanwhile, joining hands to preserve heritage, the Indian Ambassador to China, Vikram Misri met with Dr Shan Jixiang, Director of Palace Museum in Beijing on Thursday and exchanged views to further enhance museum cooperation between India and China. The Indian delegation was led by Mahaveer Singhvi, the Joint Secretary for Counter Terrorism at the Ministry of External Affairs, while the Chinese delegation was led by Liu Shaobin the Director General, Department of External Security Affairs of Chinese Ministry of Foreign Affairs.